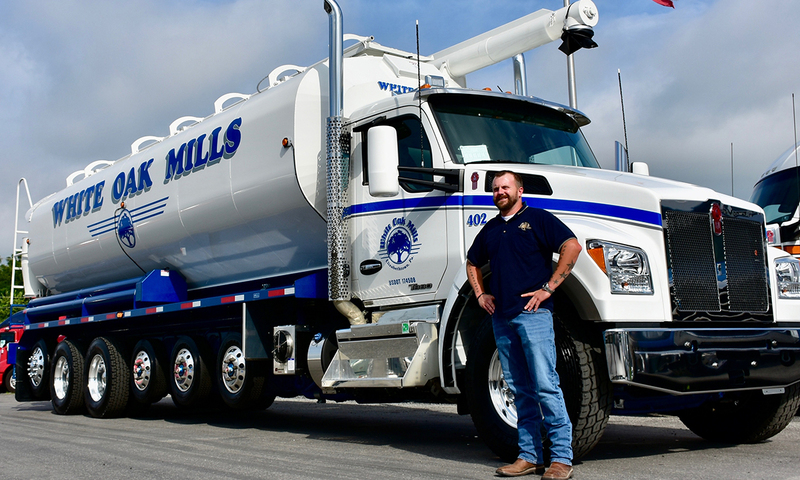 Kenworth Truck Co. manufactured a 7-axle straight truck for White Oak Mills, marking the first time the OEM had made such a vehicle starting with its T880S platform. In a Sept. 6 statement, Kenworth said White Oak Mills is a feed manufacturer based in Elizabethtown, Pa. Kenworth is a unit of Paccar Inc.
Josh Long, White Oak’s transportation manager, said the 7-axle configuration with 26-foot Walinga feed body allows the company to increase the amount of animal feed it hauls into Maryland and New Jersey. The maximum payload now is 22.75 tons, up from 11.25 tons, the Kenworth statement said. “This is huge for our company, especially in neighboring states where our load was restricted due to state laws,” Long said. Maximum weights are set by states using a bridge formula that analyzes weights and how they are spread out over truck axles. The specifications for the truck include a shorter hood of 114 inches, a set-forward front axle and a Paccar MX-13 engine with 510 horsepower and 1,850 pound-feet of torque. The powertrain has an 18-speed transmission. The vehicle’s overall length is 45 feet, with 45-inch spacing between the pusher axles and a 54-inch space for the tag axle, Kenworth said.